Having to represent the number 10 three different ways. 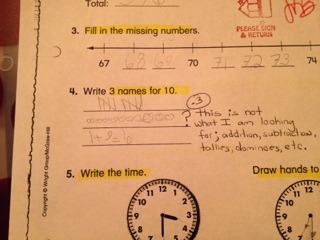 Her first answer: 10 tally marks. Her second answer: 1+9=10. Her third answer: priceless and very, very Sophie. Yes, 10 hearts. Not another mathematical expression or dominoes or squares or diamonds or trapezoids. Ten hearts. But hearts apparently don’t count, so she lost points. I don’t care, though. I just love the fact that she used hearts on her math test. That’s my Sophie.